This is a full service, all suites hotel. Only 6 miles from the St. Raphael Center, our base of operation. Speak to Molly Papay and ask for the "Mother Angelica Tour" discount when calling for reservations. Located 3 miles from St Raphael Center, our base of operation. Ask for the "Mother Angelica Tour" discount when calling for reservations. 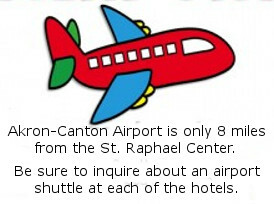 Shuttle service must be set up a day in advance to St. Raphael Center. Located 4 miles from St Raphael Center, our base of operation.